Although it has been eons since my last post, I am still alive but have been greatly distracted by some personal matters during the last few months. My poor little blog has suffered from negligence but alas, an infusion of some creative juice will hopefully rescue it from complete dissolution. Let me show you a few cakes that I did manage to do during this hiatus. 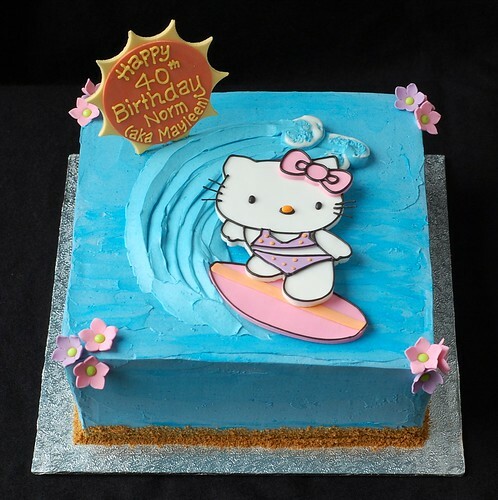 This surfing Hello Kitty cake was from the end of September for a young-at-heart 40 year old. Blue buttercream scares me a little but what else is Hello Kitty going to surf on? Then, in early November, my niece Caitlin turned six. You may remember her past cake requests involved turtles, rainbows, and planets. 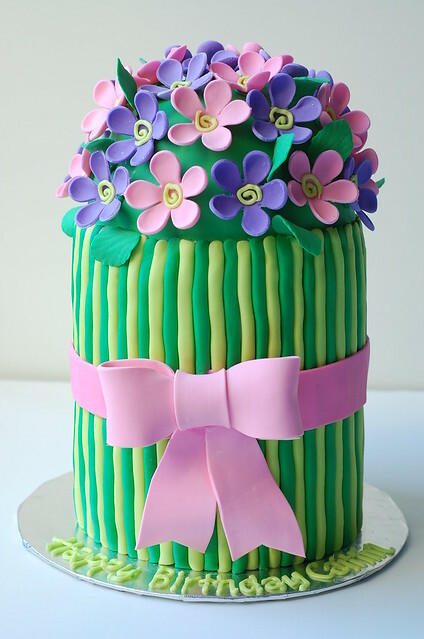 This year, she wanted a flower cake. Rather than your typical big fat daisy cake, I remembered seeing Penny Porschen's posy mini-cakes in a book and decided to re-create it in larger form. Two 6 inch round tiers were stacked and then topped with a 6 inch half-dome. At first, I thought that this cake would be quick and easy but it was actually fairly time-consuming to roll out all those thin stems!